Alex Garrett of the F.P. Walshe Flyers serves. Alex Garrett, Tiegan Trotter and the F.P. Walshe Flyers celebrate their round-robin win over Magrath Pandas. Grace Boutland defends for the F.P. Walshe Flyers. McKenzie Phillips of the F.P. Walshe Flyers stretches to keep the ball in play. Tiegan Trotter bumps for the F.P. Walshe Flyers. F.P. Walshe Flyers exceeded expectations with a fourth-place finish at the 2A high school girls zone playoff tournament. Seeded sixth going into the tournament at Lethbridge College, the Flyers made it to the bronze medal match. The Flyers opened the tournament in Pool B with St. Mary’s Auroras from Taber, Magrath Pandas, Willow Creek Composite Cobras and Kainai Lady Warriors. Pool A was made up of Vauxhall Queens, Kate Andrews Pride from Coaldale, Raymond Comets, Immanuel Christian Eagles and County Central Hawks from Vulcan. 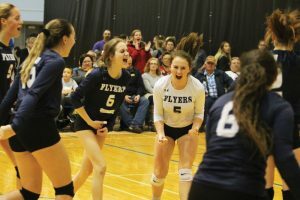 In their first match of the tournament on Thursday, the Flyers earned a hard-fought win over Kainai. The Lady Warriors beat the Flyers 25-20 in the first set, but F.P. Walshe evened the match with a tight 26-24 win in the second set. In the third and deciding set the Flyers prevailed 15-9. The Flyers were back in action Friday afternoon against Willow Creek Cobras from Claresholm. In a tough first set, the Cobras edged the Flyers 25-23 to take the lead in the match. F.P. Walshe evened the match with a 25-15 win in the second set, and then charmed the Cobras 15-11 in the third and deciding set. The Flyers in their third tournament match took on Magrath Pandas, who have had the Flyers number all season long. F.P. Walshe opened the match Friday evening with a convincing 25-14 win. Magrath turned the tables in the second set, grounding the Flyers 25-13 to force a tiebreaker. 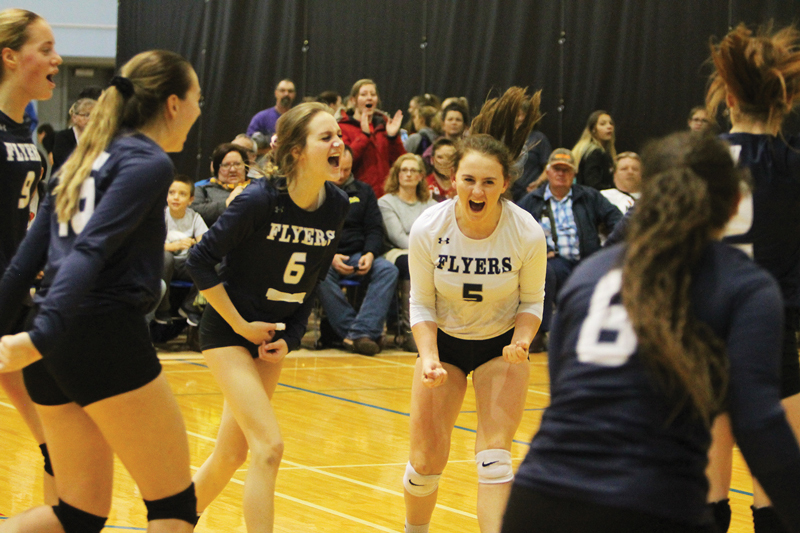 The third set was a thriller, with the Flyers opening a three-point lead that Magrath could never overcome as F.P. Walshe won the match with a 15-10 victory. The Flyers met St. Mary’s on Friday night in their final round-robin match, with a victory guaranteeing F.P. Walshe top spot in their pool and a bye into the semifinals on Saturday. St Mary’s had other ideas, though, as they beat the Flyers 25-11 and 25-18. 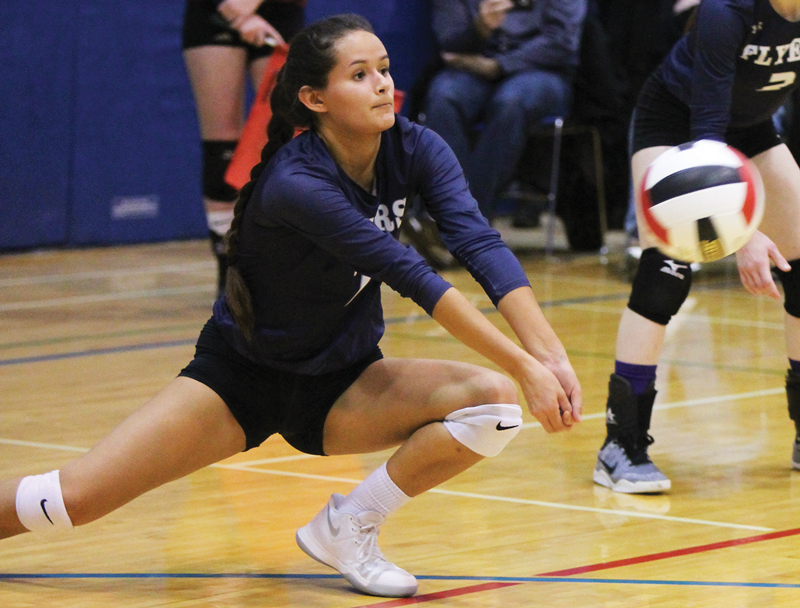 Magrath, St. Mary’s and the Flyers finished the tournament with three match wins and one loss apiece. 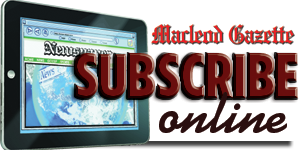 Willow Creek was fourth with one win and Kainai was 0-4. 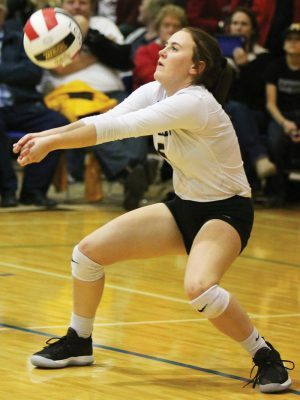 In Pool A, Vauxhall placed first with four wins, followed by Immanuel Christian at 3-1, Kate Andrews at 2-2, Raymond at 1-3 and County Central at 0-4. The quarterfinals saw F.P. Walshe cross over to play Immanuel Christian, and St. Mary’s take on Kate Andrews. The Flyers topped the Eagles 25-14 in the first set and clinched the match with a 25-20 decision in the second set. In the other quarterfinal St. Mary’s beat Kate Andrews 25-19 and 25-17. The Flyers opened the semifinal match with Magrath with a 25-20 win in the first set. The Pandas tied the match with a 25-20 win in the second set, and grounded the Flyers 15-6 in the tiebreaker. The loss sent the Flyers to the bronze medal match against St. Mary’s, who lost 25-15 and 25-22 to Vauxhall in the other semifinal. St. Mary’s captured the bronze, beating F.P. Walshe 25-14 and 25-18 to put the Flyers in fourth place. Vauxhall beat Magrath 25-4 and 25-18 to win the gold medal.